All four indices moved higher again on Tuesday ahead of President Trump’s State of the Union address. The Nasdaq led the way again with a gain of 0.74% and it was followed by the Dow which tacked on 0.68%. The S&P logged a gain of 0.47% while the Russell trailed the others with a gain of 0.18%. Seven of the 10 main sectors moved higher on Tuesday while one was unchanged and two moved lower. The consumer staples sector was the one that was unchanged. The communication services sector led the way with a gain of 1.08% and it was followed by the consumer discretionary sector with a gain of 0.94%. The healthcare sector was the worst performing sector for the second straight day, falling 0.12% on the day. The financial sector fell 0.11% as the only other sector in the red on Tuesday. My scans turned more negative last night with 62 names on the bearish list and only two names on the bullish side. The -60 differential is the biggest negative number since January 22 and the 19th straight negative reading. The barometer fell once the results were added in to the equation, dropping from -30.1 to -40.5. One of the more interesting names on the bearish list was the SPDR S&P Biotech ETF (NYSE: XBI). The industry has been in the spotlight recently as drug prices are under fire once again. President Trump has recently released some proposals to bring drug prices down. You can see how the XBI found temporary support at the $85 level in October before falling down to $75. 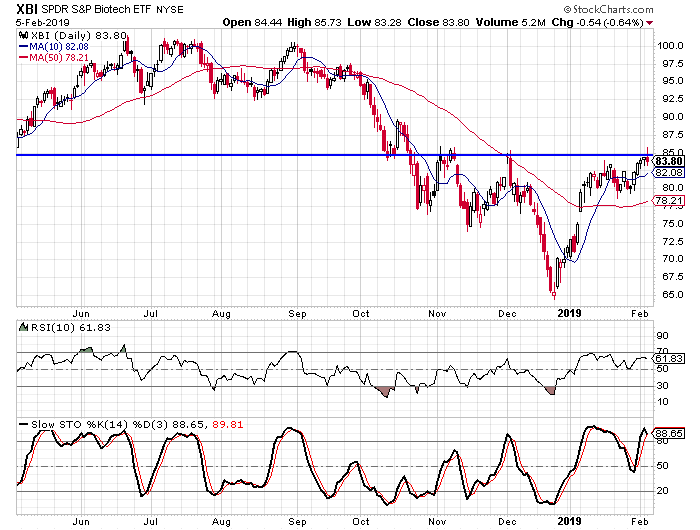 The fund attempted to rally above the $85 area in November and again in December, but couldn’t break through. I look for $85 to act as resistance once again. Buy to open the April $85-strike puts on XBI at $5.00 or better. These options expire on April 18. The options will double if the fund falls to $75 and that is well above the low in December. The $75 level was an area of support in November and the fund could be forming an inverse head and shoulders pattern. To complete the pattern it would need to fall to $75 again and then turn higher. I suggest a target gain of 100% with a stop at $86.